Her bright, colourful floral prints and ladylike frocks have always put a smile on my face. Lillian “Lilly” McKim was born to socialites Robert McKim and Lillian Bostwick McKim (later Phipps), a Standard Oil heiress via her grandfather, Jabez A. Bostwick, who was one of John D. Rockefeller’s founding partners in the Standard Oil Company. She had two sisters, Mary Maude and Florence Fitch. When her mother later married Ogden Phipps, she gained two half-siblings, Ogden Mills and Cynthia. The “Queen of Prep” was a school friend of Jacqueline Bouvier (later Kennedy Onassis) and Lee Bouvier (later Radziwill) at the Chapin School in New York, and was friends with many other famous folk such as the Vanderbilts and Whitneys throughout her life. She graduated from Miss Porter’s School in Farmington, Connecticut in 1949. She married twice: Herbert “Peter” Pulitzer, Jr. (1950-1969; divorced), grandson of publisher Joseph Pulitzer, and Enrique Rousseau (1969-1993; his death). Peter owned several Florida citrus orange groves, and with produce from the groves Lilly opened a juice stand on Via Mizner, just off Worth Avenue in Palm Beach. In the course of working at the juice stand, Lilly found that squeezing juice made a mess of her clothes. 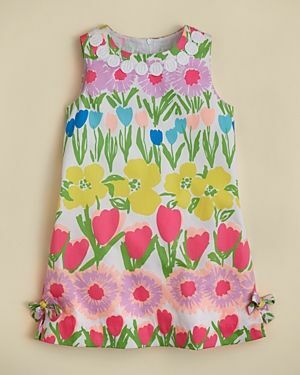 Seeking to camouflage the juice stains, she designed a sleeveless shift dress made of bright, colorful printed cotton. Lilly found that customers loved her dress, so she produced more in order to sell them at her juice stand. Eventually, she was selling more dresses than juice, and decided to focus on designing and selling what had become known as her “Lillys”. In 1959, she became president of her own company, Lilly Pulitzer, Inc. The company’s main factory was located in Miami, Florida and the fabrics were produced by the Key West Hand Print Fabrics company in Key West. She had three children with Peter Pulitzer: Peter, Minnie, and Liza. The brand has gone onto worldwide success, venturing into various products including clothes, jewelry, stationery, bridal, homewares and furniture products, across 75 signature stores as well as being stocked by major department stores. Sugartown Worldwide was purchased by Oxford Industries in 2010. She died at her Palm Beach, Florida home at the age of 81 in 2013. My condolences to her family, friends and colleagues. This entry was posted in Uncategorized and tagged a socialite life, bold, bright, cheery, florida, lilly pulitzer, palm beach.